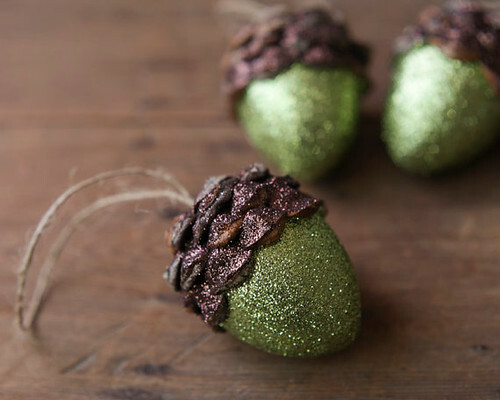 When I first spotted these pretty acorn ornaments, they brought forth a mental smile - I remember finely glittered ornaments on my grandmother's Christmas tree. Lo and behold, clicking on the photo took me to a shop with 'smile' in the name - how apt! Valerie Lloyd's Smile Mercantile is filled with little lovelies like these... items that bring back pleasant memories of times gone by. Vintage. Not that recalling such things means I'm vintage. Ahem... no. Valerie's interest in old cameras and photography is what launched her shop. She began sourcing more than just cameras... velvet millinery leaves, pincushion tomatoes, and old buttons - lots and lots of buttons. Among the vintage treasures, you'll find novelties that Valerie makes by hand to evoke, as she says, "a historical sense of beauty." She also creates rag and twine-covered paper maché ornaments, as well as sheet music and book page roses and angels. Smile Mercantile's website and Etsy shop. Have a Fab Friday and a great weekend, everyone! Valerie's Etsy shop, "Smile Mercantile" is gorgeously curated. I love how well she has gathered and displayed so many seemingly different items. They are seamless under her curation. Thanks for sharing about her, Ann.